2 rather extensive correspondence with several people, and because I have a car to keep it in if I don't have room in my locker or quarters. In short, travel as lightly as possible & in a small suitcase. That is my advice, though, as I said at first, you may (I doubt it) have more use for civilian clothes than I expect. Asking for instructors duty is not dodging your duty. They need instructors & you'll eventually be sent to active duty anyway. It is an opportunity to get in some extra hours & experience before playing for keeps. 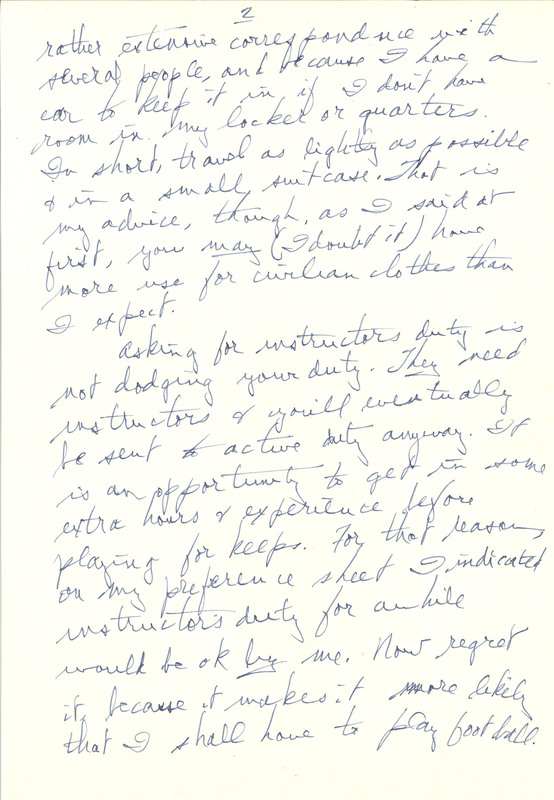 For that reason, on my preference sheet I indicated instructor's duty for awhile would be ok by me. Now regret it, because it makes it more likely that I shall have to play football.